Rotarian Brett Wright with Mt. Holly teacher Laura Lienhard and her first grade students receiving the books. Personalized books are presented to each student. 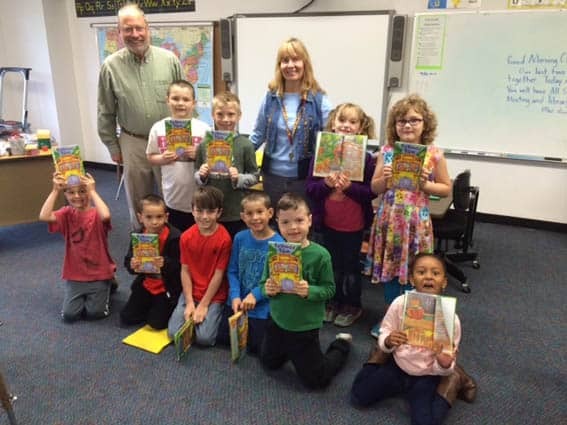 Each year the Ludlow Rotary Club distributes books to all first graders within the Rotary’s club service area of Ludlow, Mt. Holly and Cavendish. Literacy is one focus point of the rotary club. The club has issued over 500 books to first graders over the years for this project. Another literacy project the club supports is the Dolly Parton Imagination Library program. Children from birth to the age of 5 can receive a free book monthly! Stop by the Fletcher Memorial Library in Ludlow for more info or a subscription form. Visit the club’s website at www.ludlowrotary.com for more info regarding these programs and fundraisers. The Ludlow Rotary Club meets on Tuesday’s at 12:15 at DJ’s Restaurant in Ludlow.